Stroke is a medical emergency. 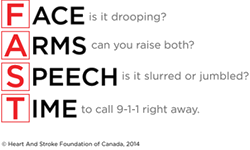 Recognizing and responding immediately to the stroke signs by calling 9-1-1 or your local emergency number can significantly improve survival and recovery. What does a stroke look like? A TIA or ‘mini stroke’ is caused by a clot; the only difference between a stroke and TIA is that with TIA the blockage is transient (temporary). TIA symptoms occur rapidly and last a relatively short time. The best way to prevent a stroke is by learning more about the risk factors you can do something about, those you can’t control, and setting an action plan. 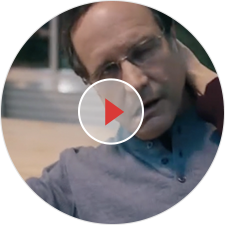 There are three main emergency treatments for stroke: tPA, surgery and non-surgical procedures. The treatment you receive will depend on the type of stroke you have, how serious your stroke was, your age and general health, and how soon you arrive at the hospital. There are two main types of stroke: those caused by blood clots (ischemic stroke) and those caused by bleeding (hemorrhagic stroke). When clots stop blood flowing to the brain for a short time, a TIA (transient ischemic attack) or “mini-stroke” can happen. It is important that people get the right services at the right time after their stroke. A part of this recovery journey should include learning how to lower the risk of future strokes. Stroke can change your life. It can affect you, your friends and your family. It is important to be aware of the resources that are available that can help you continue your recovery, make healthy life choices, provide support to you and your family and adjust to life after stroke.